Ever since I took British Literature my senior year of high school, I have been smitten with classics such as: Jane Eyre, Wuthering Heights and Pride and Prejudice. Naturally, I chose to keep the books once I read them for class and have even picked up a few of them since (especially while studying in Oxford...something about the intellectual air!). 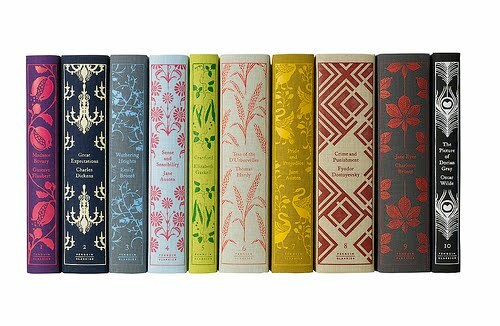 But I would gladly pass on my older versions for a beautiful set of these! 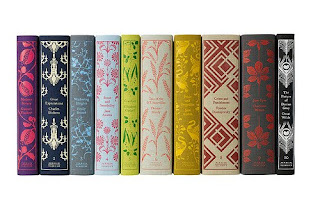 How charming would they look sitting atop our bookshelf?! I might even be inspired to read them again! i cannot get into the classics. i read 3/4 of great expectations and quit because it was killing me! Ha! Never really liked Great Expectations, but Jane Eyre is one of my faves along with Pride and Prejudice and Sense and Sensibility. I absolutely hated Picture of Dorian Gray!